Time travel is the concept of moving between different points in time in a manner analogous to moving between different points in space, either sending objects (or in some cases just information) backwards in time to some moment before the present, or sending objects forward from the present to the future without the need to experience the intervening period. (at least not at the normal rate). Any technological device, whether fictional or hypothetical, that is used to achieve time travel is commonly known as a time machine. Einstein´s theories of relativity, and quantum mechanics, are today often used as arguments for the possibility of time travel. Some interpretations of time travel also suggest that an attempt to travel backwards in time might take one to a parallel universe whose history would begin to diverge from the traveler´s original history after the moment the traveler arrived in the past. Some theories, most notably special and general relativity, suggest that suitable geometries of spacetime, or specific types of motion in space, might allow time travel into the past and future if these geometries or motions are possible. In technical papers, physicists generally avoid the commonplace language of “moving” or “traveling” through time (´movement´ normally refers only to a change in spatial position as the time coordinate is varied), and instead discuss the possibility of closed timelike curves, which are worldliness that form closed loops in spacetime, allowing objects to return to their own past. There are known to be solutions to the equations of general relativity that describe spacetimes which contain closed timelike cruves (such as Gödel spacetime), but the physical plausibility of these solutions is uncertain. Relativity states that if one were to move away from Earth at relativistic velocities and return, more time would have passed on Earth that for the traveler, so in this sense it is accepted that relativity allows “travel into the future” (according to relativity there is no single objective answer to how much time has “really” passed between the departure and the return, but there is an objective answer to how much proper time has been experienced by both the Earth and the traveler, i.e. how much each has aged. On the other hand, many in the scientific community believe that backwards time travel is highly unlikely. Any theory which would allow time travel would require that problems of causality be resolved. The classic example of a problem involving causality is the “grandfather paradox”: what if one were to go back in time and kill one´s own grandfather before one´s father was conceived? But some scientists believe that paradoxes can be avoided, either by appealing to the Novikov self-consistency principle or the notion of parallel universes (explanation follows). Stephen Hawking once suggested that the absence of tourists from the future constitutes an argument against the existence of time travel – a variant of the Fermi paradox. Of course this would not prove that time travel is physically impossible, since it might be that time travel is physically possible but that it is never in fact developed (or is cautiously never used); and even if it is developed, Hawking notes elsewhere that time travel might only be possible in a region of spacetime that is warped in the correct way, and that if we cannot create such a region until the future, then time travelers would not be able to travel back before that date, so “This picture would explain why we haven´t been over run by tourists from the future.” Carl Sagan also once suggested the possibility that time travelers could be here, but are disguising their existence or are not recognized as time travelers. However, the theory of general relativity does suggest scientific grounds for thinking backwards time travel could be possible in certain unusual scenarios, although arguments from semiclassical gravity suggest that when quantum effects are incorporated into general relativity, these loopholes may be closed. These semiclassical arguments led Hawking to formulate the chronology protection conjecture, suggesting that the fundamental laws of nature prevent time travel, but physicists cannot come to a definite judgment on the issue without a theory of quantum gravity to join quantum mechanics and general relativity into a complete unified theory. Time travel has been a common plot device in fiction since the 19th century, but the thought is probably as old as the human thought. You see it in Hindu mythology in the Mahabharata (770s BCE to 300s CE), in the Talmud (220s to 400s CE), in the Japanese tale of "Urashima Taro”(720 CE), Samuel Madden´s Memoirs of the Twentieth Century (1733), Louis-Sébastain Mercier´s L´An 2440, rêve s´il en fût jamais (1771), Johan Herman Wessel´s Anno 7603, Washington Irving´s “Rip Van Winkle” (1819), Faddey Bulgarin´s “Pravdopodobnie Nebylitsi” (1824), Alexander Veltman´s Predki Kalimerosa (1836), Missing one´s Coach: An Anachronism (1838), Charles Dicken´s A Christmas Carol (1843), Pierre Boitard´s Paris avant les hommes (1861), Edward Page Mitchell´s The Clock That Went Backward (1881), Enrique Gaspar y Rimbau´s El anacronópete (1887), H.G. Well´s The Chronic Argonauts (1888), Mark Twain´s A Connecticut Yankee in King Arthur´s Court (1889), H.G. Well´s The Time Machine (1895). Time travel themes in fiction and media can generally be grouped into three general categories (based on effect – methods are extremely varied and numerous), each of which can be further subdevided. Note: These classifications do not address the method (the scientific explanation) of time travel itself, i.e. how to travel through time, but instead call to attention differing rules of what happens to history. But this attention is very important in order to understand all the paradoxes time travel involves, and I will go deeper into it, because it is important in relation to my further argumentation. 1) There is a single fixed history, which is self-consistent and unchangeable. In this version, everything happens on a single timeline which does not contradict itself and cannot interact with anything potentially existing outside of it. 1.1 This can be simply achieved by applying the Novikov self-consistency principle, named after dr. Igor Novikov, Professor of Astrophysics at Copenhagen University. The principle states that the timeline is totally fixed, and any actions taken by a time traveler were part of history all along, so it is impossible for the time traveler to “change” history in any way. The time traveler´s actions may be the cause of events in their own past though, which leads to the potential for circular causation and the predestination paradox; for examples of circular causation, see Robert A. Heinley´s story “By His Bootstraps”. The Novikov self-consistency principle proposes that the local laws of physics in a region of spacetime containing time travelers cannot be any different from the local laws of any other region of spacetime. Examples include Doctor Who and the Back to the Future trilogy. In some cases, any resulting paradoxes can be devastating, threatening the very existence of the universe. In other cases the traveler simply cannot return home. The extrme version of this (Chaotic Time) is that history is very sensitive to changes with even small changes having large impacts such as in Ray Bradbury´s “A Sound of Thunder”. i.e small trivial events can be readily changed but large ones take great effort. In the Twilight Zone episode “Back There” a traveler tries to prevent the assassination of President Lincoln and fails, but his actions have made subtle changes to the status que in his own time (e.g. a man who had been the butler of his gentleman´s club is now a rich tycoon). In the 2002 remake of The Time Machine, it is explained via a vision why Hartdegen could not save his sweetheart Emma – doing so would have resulted in his never developing the time machine he used to try and save her. In The Saga of Darren Shan, major events in the past cannot be changed, but their details can alter while providing the same outcome. Under this model, if a time traveler were to go back in time and kill Hitler, another Nazi would simply take his place and commit his same actions, leaving the broader cause of history unchanged. In the Doctor Who episode The Waters of Mars, Captain Adelaide Brooke´s death on Mars is the most singular catalyst of human travel outside the solar system. At first, the Doctor realizes her death is a “fixed point in time” and does not intervene, but later defies this rule and transports her and her crew to Earth. Rather than allow human history to change, Captain Brooke commits suicide on Earth, leaving history mostly unchanged. In this version of time travel, there are multible coexisting alternate histories, so that when the traveler goes back in time, he/she ends up in a new timeline where historical events can differ from the timeline he/she came from, but her original timeline does not cease to exist (this means the grandfather paradox can be avoided since even if the timer traveler´s grandfather is killed at a young age in the new timeline, he still survived to have children in the original timeline, so there is still a causal explanation for the traveler´s existence). Time travel may actually create a new timeline that diverges from the original timeline at the moment the time traveler appears in the past, or the traveler may arrive in an already existing parallel universe (though unless the parallel universe´s history was identical to the time traveler´s history up until the point where the time traveler appeared, it is questionable whether the latter version qualifies as “time travel”). James P. Hogan´s The Proteus Operation fully explains parallel universe time travel in chapter 20 where it has Einstein explaining that all the outcomes already exist and all time travel does is change which already existing branch you will experience. Though Star Trek has along tradition of using the 2.1 mechanic, as seen in “The City on the Edge of Forever”, “Tomorrow is Yesterday”, “Time and Again”, “Future´s End”, “Before and After”, “Endgame”, and as late as Enterprise´s Temporal Cold War, “Parallels” had an example of what Data called “quantum realities.” His exact words on the matter were “But there is a theory in quantum physics that all the possibilities that can happen do happen in alternate quantum realities,” suggesting the writers were thinking of the many-worlds interpretation of quantum mechanics. Michael Crichton´s novel Timeline takes the approach that all time travel really is travel to an already existing parallel universe where time passes at a slower rate than our own but actions in any of these parallel universes may have already occurred in our past. It is unclear from the novel if any sizable change in events of these parallel universes can be made. In the Homeline of GURPS Infinite Worlds there are chaos – parallel universes at an early part of Homeline´ s history but changes to their history do not affect Homeline´s history. However tambering with their history can cause them to shift quanta making access harder if not impossible. A type of story which could be placed in this category is one where the alternative version of the past lies not in some other dimension, but simply at a distant location in space or a future period of time that replicates conditions in the traveler´s past. For example, in a Futurama episode called The Late Philip J. Fry, the professor designed a forward-only time travel device. Trapped in the future, he and two colleagues travel forward all the way to the end of the universe, at which point they witness a new Big Bang which gives rise to a new universe whose history mirrors their own history. Then they continue to go forward until they reach the exact time of their initial departure. Although this journey is not exactly a backward time travel, the final result is the same. In the Japanese manga, Dragon Ball Z, the character Trunks travels back in time to warn the characters of their deaths soon to come. This does not change his timeline, only creates a new one in which they do not die. Soon two of the characters destroy the lab where the monster Cell is being created, stopping him from absorbing the androids, creating a third timeline. Later it is revealed that Trunks is killed by Cell in the future, then travels to three years before any of the events occurs, which creates a fourth timeline. No matter what any character does in the past, their own original timeline is unchanged. An urban legend is a form of modern folklore consisting of stories usually believed by their tellers to be true. Urban legends are sometimes repeated in news stories and, in recent years, distributed through the internet. Today urban legends therefore often use other genres such as secret history, conspiracy theories, collaborative fiction, alternate reality games, transmedia storytelling and alternate history. A mystical experiment took place in Philadelphia´s naval port October 28 1943. When a line of big, electromagnetic generators were turned on aboard the destroyer USS Eldridge, a fog gathered around the ship, a heavily blue light followed, and USS Eldridge disappeared! At the same time the ship appeared in Norfolk, Virginia, and was here observed in several minutes, before Eldridge turned back to Philadelphia. The sailors, who had experienced this travel in time and space, were hit by strange illnesses. Some became invisible, some went into disintegration, and others went insane. So says the myth about The Philadelphia Experiment. There is disagreement about the precise date and whether there were one or two experiments, but the fundamental features in the story are the same. The experiment was carried out by the American navy in an attempt to make naval vessels invisible to the radars of the enemy. However the results were much more far reaching. The ship ended namely with moving both in time and space. The navy had – conscious or unconscious – discovered a way of moving in time and space through so-called wormholes created by magnetic fields. In the time before Second World War Albert Einstein also worked on formulating a ”Unified Field Theory” about the connection between magnetism and gravitation. The theory is also called ”The theory of everything”, ”God´s formula” and ”The Holy Grail of Physics” and could acquire much more far reaching importance than the theory of relativity. Maybe even open to completely new potentials such as time travel and pure energy. Albert Einstein never reached to solve the riddle and was drawing his work back, but some conspiracy theorists think, that he in fact solved the riddle but was hiding the result, because mankind wasn't ready for the consequences of his theoretical work. Albert Einstein wasn't the only one, who was occupied with time theories. The mystical scientist and inventor, Nikola Tesla, worked with rotatory magnetic fields, time travel, death beams, artificial lightning and transport of energy without wires. He doesn´t belong among the most famous physicists, but it was him, who invented the alternator, the remote control and the basic principles behind the radio. He has had the unit of measurement tesla, which indicates the strenght of magnets, named after him. Nikola Tesla was an odd man with many phobias. Afraid of germs, crazy with doves and extreme occupied by, that his actions went up in the number three! However something suggests, that he had success with parts of his mystical work, because when he died, his results were confiscated by the authorities – despite protests from family. Conspiracy theorists disagree about, whether the American navy used Nikola Tesla´s results, Albert Einstein´s secret formula or even extraterrestrial technology, when they in 1943 carried out the experiment, which later should become known as The Philadelphia Experiment. One thing they however agree about: the result surpassed their wildest expectations. In some versions of the story the ship not just moved in distance, it also moved in time. The destroyer was – either at the same time or in a following experiment – transported 40 years forward in time. The sailors thought, that they were back in Philadelphia´s port, and some of the terrified crewmembers jumped overboard and swam into the quay. Here they discovered, that they had come to Long Island in 1983! They were received by an old scientist and some military people, who had waited for this moment in 40 years. Ever after the experiment in 1943 they had known, that the ship would emerge. The crewmembers were directed back on board the ship not to create imbalance in the spacetime. Among the time travel´s side effects were, that the sailors risked to become insane or direct disintegrated. And that they years after the travel suddenly could freeze for hours at a time or become invisible in shorter or longer periods of time. The myth about The Philadelphia Experiment took form at the end of the 1950s, when the author to the book The Case for the UFO, Morris k. Jessup, referred a story from Carl Meredith Allen aka Carlos Miguel Allende, who allegedly had seen USS Eldridge emerge in Norfolk. Through the years the myth has got new life in several books and a few movies. The most famous is William Moore and Charles Berlitz´s book The Philadelphia Experiment: Project Invisibility from 1979. They also used Morris k. Jessup as primary source. Morris k. Jessup committed suicide in 1959, but conspiracy theorists think, that he was murdered, because he came to close to the truth. 1) Carl Meredith Allen is the only source and the only witness to the experiment. And that he in 1969 admitted, that parts of the story was made-up. The lacks of the theory in form of clues and evidence have however not exploded the myth. If you think, that such experiments took place in secret, it is also natural to suppose, that the masterminds could hide the trails after the experiment. However, The Philadelphia Experiment is one of the conspiracy theories, which lies in the border between urban legends and conspiracy theories. The Montauk Project was alleged to be a series of secret United States government projects conducted at Camp Hero or Montauk Air Force Station on Montauk, Long Island for the purpose of developing psychological warfare techniques and exotic research including time travel. Experiments involving teleportation, time travel, contact with extraterrestrials, and mind control are frequently alleged to have been conducted at the camp. Conspiracy theories about the Montauk Project have circulated since the early 1980s. According to astrophysicist and UFO researcher Jacques Valleé, the Montauk Experiment stories seem to have originated with the account of Preston Nichols, who claimed to have recovered repressed memories of his own involvement (see my article Regression psychotherapies). He has authored five books on the subject, including Montauk Project: Experiments in time. There is no definitive version of the Montauk Project narrative, but the most common accounts describe it as an extension or a continuation of the Philadelphia Experiment. Ong´s Hat, New Jersey, is a location of what has been called a ghost town in Southampton Township, Burlington County, New Jersey. As a long-abandoned small settlement, Ong´s Hat remained obscure until its name and location was co-opted in a book called Ong´s Hat: The Beginning by Joseph Matheny, which was based on stories that had circulated on computer bulletin boards, which held that a cult of outcast scientists opened an interdimensional gateway in Ong´s Hat. Matheny was not clear to whether his book was intended as fact or fiction. Ong´s Hat was one of the earliest internet-based secret history conspiracy theories created as a piece of collaborative fiction (aka Incunabula) by four core individuals, although the membership propagating the tale changed over time. Joseph Matheny was intimately involved and eventually concluded the project. UFOs and aliens are not necessarily visitors from distant solar systems. With the knowledge we have today, it is not possible to travel faster than the speed of light, a bit under 300.000 kilometres per second. It is at a snail´s pace in relation to the colossal distances in space. Therefore UFO enthusiats eagerly talk about, how aliens can reach Earth from other stars without using centuries on the travel. Many UFO believers think, that the alien lifeforms travel through wormholes or others gates in spacetime. However there also exists a line of much more far reaching theories, which collect religion, life after death, UFO observations, ghosts and parapsychology, under one explanation. The theories claim that the world we know only is one dimension in a set of parallel universes. That could mean, that UFO observations, ghosts, communication with the dead, etc. etc., in reality are visits from, or interaction with, other parallel worlds. The big mystery is then, how to move between the various planes. Perhaps it is death, which opens the door to a new dimension. Perhaps Earth and our dimension just are a kindergarten in the life of the soul, and UFOs a kind of educators, which keep an eye on us. There exist many such New Age theories. The explanations are fascinating, and from a philosophical point of view the theories are also interesting, because they deal with the riddles of existence. But when the theories are used to more than philosophizing over the meaning of life, it can become dangerous. Many of the mystical neo-religious sects, which are building on UFO inspired theories, are notorious in using manipulation when recruiting new disciples. Even murder and collective suicide have happened in neo-religious sects. Marshall Applewhite (1931-1997) was leader of the UFO doomsday cult Heaven´s Gate. He and 38 other members committed suicide on March 26, 1997 – allegedly in order to meet aliens in a spacecraft disguised as the comet HALE-BOPP. In the world of conspiracy theories there are a genre of theories, which are called Unified Theories – meaning theories, which collect many mysteries into one great theory. The theory about parallel universes is one of such unifying theories. Science has partly replaced ancient myths. But it can´t explain everything, and therefore many feel the need for a new and modern mythology. That is precisely what the American website wingmakers.com offers. The origin of the mythology is an important part of the story on this website. We are told that two students, who in 1996 were hiking in the desert in the northern New Mexico, near an ancient archaeological site, called Chaco Canyon, found a mystical metallic artifact from space. A classified UFO department in the American security service NSA was assigned to investigate the discovery. This department is called the Advanced Contact Intelligence Organization (ACIO). The place for the discovery was called The Ancient Arrow site, and the assignment for ACIO was called The Ancient Arrow Project. The artifact, which becomes known among ACIO operatives as the Compass, led them to a large, spiral cave system of 23 + 1 chambers, which was created in the year 826 by beings from a distant galaxy. These beings call themselves WingMakers. WingMakers are time travelers from 750 years in the future, and have therefore traveled back in time to the year 826 in order to place time capsules here. They are shortly said future models of ourselves, who travel in time, in order to correct genetic and historical ”flaws”. We see here, that the WingMakers Story is based on the theory of time travel, which claims that history is flexible and is subject to change (Plastic Time). In each chamber there was a wall painting and a technological artifact from space. In the last chamber the artifact was an optical disc presumably holding the information about the site´s creators and their purpose. After considerable effort to access the optical disc, the ACIO team, led by Jamisson Neruda, finally succeeds, and determines the creators of the site as the WingMakers. Over 8000 pages of philosophy, poetry, music, genetics, sub-dimensional equations, and cosmology are contained within the disc. This cave system is the first of seven so-called time capsules, spread around the world. The last six time capsules are yet to be discovered. The optical disc was leaked one year after the discovery, and a part of the contents has thereafter ended up on wingmakers.com. The webmaster Mark Hempel says, that he is just passing on, what he is told by a contact person (Sarah de Rosnay). In 2001, though, Hempel was contacted by a new person, James, who claims, that it is him who is the mastermind behind. Sarah de Rosnay is only his assistent. So, James is the creator of the WingMakers material. He is claimed to be a specialist from the WingMakers, and an expert in “transposing Tributary Zones to three dimensional space/time worlds in the form of encoded sensory data streams.” In other words, he is a kind of what Hindu religion calls an Avatar. In Western terminology he would be known as a Messiah. I will return to the website´s problem of using obscure language about very known concepts. The website contains an (overwhelming) introduction, a half book (The Ancient Arrow Project Novel) about how the chambers was discovered, and Sarah de Rosnay´s four long interviews with the person, who leaked the optical disc (Dr. Jamisson Neruda). The interviews can be read in extension of the book. They tell an even more fantastic story about how ACIO for a long time had been in contact with beings from other planets. They exchange knowledge and co-operate about the development of new technology, which makes possible clairvoyance, materializations, time travel and much more. Examples are Light Encoded Reality Matrix (LERN), Memory Restructure Program (MRP), Remote viewing Technology (RV), Personal Mole Tracking Devices (PMs), and of course Blank Slate Tecknology (BST), which is about interactive time travel, which purpose is to deflect the prophesied Animus from Earth. Here we see the inspiration from the Montauk Project. So, there are also hostile beings (Animus), who want to take over Earth because of its great biological variation. They namely want to reproduce themselves by means of our genes. But WingMakers is the most sophisticated race, it is said. They are the central race in the universe, and the first race, which was created by God. They have genetically created us humans, and they guard us. The also help us to develop ourselves, and around year 2080 a great deal of mankind will have realized The Soul or The self. For those, who want to deepen themselves more in WingMakers´ spiritual teaching, there are four philosophical texts, and James´ responses to questions. Moreover the website contains the 24 wall paintings, 48 poems and extract of pieces of music. It is all divided in relation to the 24 chambers in this time capsule, and the meaning is that they shall have a transcendent effect and in this way be a portal to ”other” dimensions of reality. The seven time capsules are also called DNA triggers. Altogether genetics is a central concept on the website. The website is incredibly extensive, worked through, and beautiful done. It is a mythology, which wants something – a fantastic synthesis of science fiction, ufology, parapsychology, theosophy and conspiracy theory. 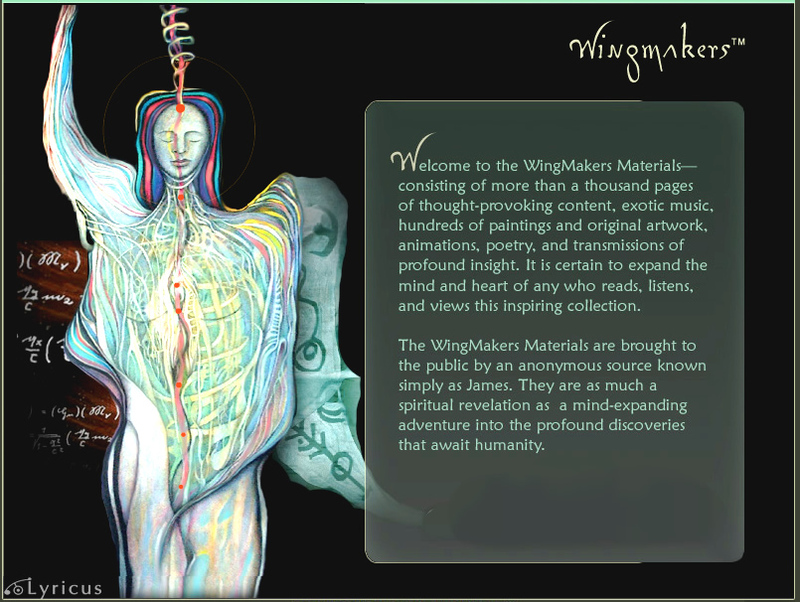 Since the original wingmakers.com in 1998, affiliated websites have been developed at lyricus.org, eventtemples.com, sovereignintegral.org, all of which are copyright Mark Hempel of WingMakers LLC. The WingMakers Project is an attempt to create an alternate history. Alternate history or alternative history is a genre of fiction consisting of stories that are set in worlds in which history has diverged from the actual history of the world. Since the 1950s this type of fiction has to a large extent merged with science fictional tropes involving cross-time travel between alternate histories or psychic awareness of the existence of “our” universe by the people in another; or ordinary voyaging uptime (into the past) or downtime (into the future) that results in history splitting into two or more time-lines. WingMakers is also a so-called secret history. A secret history (or shadow history) is a revisionist interpretation of either fictional or real (or known) history, which is claimed to have been deliberately suppressed, forgotten, or ignored by established scholars. Originally, secret histories were designed as non-fictional, revealing or claiming to reveal the truth behind the “spin”. Today we see how secret history sometimes is used in a long-running science fiction or fantasy universe to preserve continuity with the present by reconciling paranormal, anachronistic, or otherwise notable but unrecorded events with what actually happened in known history; for instance in the already mentioned fictional time travel theories. The WingMakers story combines this with the urban legend and alternate history from the Ong´s Hat myth. Though the WingMakers website tries to avoid critique by saying it is a modern mythology (where urban legends are considered as a modern folklore) it also keeps on, precisely as in urban legends, to insinuate that the story is true (more about this below). It is therefore a piece of pseudohistory. Pseudohistory is purported history such as Afrocentrism, creationism, holocaust revisionism and the catastrophism of Immanuel Velikovsky. Pseudohistory should be distinguished from the ancient texts it is based on. The sagas, legends, myths and histories, which have been passed on orally or in written documents by ancient peoples are sometimes called pseudohistory. Some of it is pseudohistory, some of it is flawed history and some of isn´ t history at all. It is clear that The WingMakers Story is inspired by everything we have investigated until now. The main source of inspiration is of course Theosophy. A secondary inspiration is the integral system of Ken Wilber (see my articles The fascism of Theosophy and A critique of Ken Wilber and his integral method). Ken Wilber´s method is a system which relativizes all point of views (except its own) as totalitarian ideologies often have practiced it. The concept of the WingMakers is just another word for the theosophical concept of the Great White Brotherhood. All in all: the only thing that actually distinguishes the websites´ writings from other theosophical inspired New Age directions, is the invented terminology. What was “spirit” now becomes “Source Intelligence”, “The Soul” is now called “Sovereign Integral”, God becomes “First source”, The “Masters of Wisdom” get superseded by an even higher order of galactic super beings, the Lyricus Teaching Order, and so on. The website is of course also inspired by the many Theosophy inspired UFO religions such as Aetherius Society, Church of the SubGenius, Heaven´s Gate, Industrial Church of the New World Comforter, Nation of Islam, Raëlism, Scientology, Unarius Academy of Science, Universe People. A neo-Nazi esoteric Nazi Gnostic sect headquartered in Vienna, Austria called the Tempelhofgesellschaft, founded in the early 1990s, teaches what it calls a form of Marcionism. They distribute pamphlets claiming that the Aryan race originally came to Atlantis from the star Aldebaran (this information is supposedly based on “ancient Sumerian manuscripts”). They maintain that the Aryans from Aldebaran derive their power from the vril energy of the Black Sun. They teach that since the Aryan race is of extraterrestrial origin it has a divine mission to dominate all the other races. It is believed by adherents of this religion that an enormous space fleet is on its way to Earth from Aldebaran which, when it arrives, will join forces with the Nazi Flying Saucers from Antarctica to establish the Western Imperium. – I mention this last UFO religion in order to point out how much fascism there is contained in all of these Theosophy inspired movements. I will return to the problem of fascism. The technique of inventing a new terminology, or replacing concepts and words in already existing works, for thereby to indicate, that you are presenting something new, is a wellknown trick made by first-year students in philosophy. The only result is, combined with the attempt of creating scientific sounding terms, that the texts become unnecessary obscure. What is the Urantia Book? The Urantia Book (published 1955) is supposedly written by super-beings from heaven and deals with eugenics and “racial purity”. It is a kind of science-fictional bible (a bible of eugenics), a work of plagiarism peppered with ideas taken from the Seventh-Day Adventism and elsewhere. The website furthermore exposes parts of the WingMakers material as direct plagiarism of the Urantia Book. The exaxt circumstances of the origin of The Urantia Book are unknown. The book and its publishers do not name a human author. Instead it is written as if directly presented by numerous celestial beings appointed to the task of providing an “epochal” religious revelation. For each paper, either a named celestial being, an order of being, or a group of beings is credited as its author. As early as 1911, William S. Sadler and his wife Lena Sadler, physicians in Chicago and well known in the community, are said to have been approached by a neighbor who was concerned because she would occasionally find her husband in a deep sleep and breathing abnormally. The Sadlers came to observe the episodes, and over time, the individual produced verbal communication that claimed to be from “student visitor” spiritual beings. This changed in early 1925 with a “voluminous handwritten document”, which from then on became the regular method of purported communication. In 1924, a group of Sadler´s friends, former patients, and colleagues began meeting for Sunday intellectual discussions, but became interested in the strange communication when Sadler mentioned the case and read samples at their request. Shortly after, a communication reportedly was received that his group would be allowed to devise questions and that answers would be given by celestial beings through the “contact personality” (in the WingMakers material this contact person is of course James). In this way it continued until all papers now collected together as The Urantia Book were obtained. The group was known as the Forum. William S. Sadler had himself written some eugenicist works, and is claimed to have had hand in editing or writing the books, and that this is how the ideas were included. The Celestine Prophecy is a 1993 novel by James Redfield that discuss various psychological and spiritual ideas which are rooted in many ancient Eastern Traditions and New Age spirituality. The main character of the novel undertakes a journey to find and understand a series of nine spiritual insights on an ancient manuscript in Peru. The book is a first-person narrative of the narrator´s spiritual awakening as he goes through a transitional period of his life. Though James Redfield admits that, even though he considers the book to be a novel, his intention was to write a story in the shape of a parable, a story meant to illustrate a point or teach a lesson. Therefore the novel is seen as a spiritual guide for the New Age. In the novel, the meaning of life is revealed in the ancient Peruvian manuscript written in Aramaic. It predicts a massive spiritual transformation of society in the late twentieth century. We will finally grasp the secrets of the universe, the mysteries of existence, the meaning of life. So, you can easily see that the Celestine Prophecy is talking about ideological education and not philosophical education as in true spirituality (see my articles The difference between philosophical education and ideological education and Six common traits of New Age that distort spirituality). What is the problem with this? The novel has some good advice, which I of course don´t disagree with, such as “make love, not war.” But there is also references to vibrations and energy, advices to avoid the negative (you can tell good people by their eyes), stop doubting, follow your intuitions and premonitions, flow with coincidences, believe in the purposiveness of everything, join thousands of others on the quest, turn into your feelings and evolve to a higher plane. Follow your intuitions and dreams as you go through your spiritual evolution. Fact or fiction, it doesn´t matter. Truth is what you make it. Life´s too short and too complicated to deal with reality. Make your own reality. This New Age subjectivism and relativism encourage people to believe that reality is whatever you want it to be. The line between fact and fiction gets blurry and obscured. And therewith people are directed into the area of magical thinking, where you don´t discriminate between image and reality. And therewith you also have the elimination of critical thinking, which precisely is about discriminating between image and reality. Critical thinking is not only crucial in science and philosophy, but also in spirituality. The Dominican mystics call this steps discriminatio, the ability to discriminate between how the energy is used temporal or religious. And despite that magical thinking actually can create something magical, then in true spirituality it is still something temporal, or relatively (black magic/occultism), which will create negative karma if practised. The Orientals call it viveka, discrimination, the ability to use your will on that part of the energy, you can steer yourself, and steer it towards exercises, prayer, mantras, meditation, instead of towards career, worldliness, self-unfolding, as for example New Thought does (see my article The New Thought movement and the law of attraction). The central teaching in both science, philosophy and spirituality is: discriminate between image and reality! So, where does New Age have this idea about subjectivism and relativism from? It neither comes from science or spirituality, but from the postmodern intellectualism on Western Universities. But if truth is what you want it to be, then you must accept, that everything from Nazism, Fascism, Dictatorship, popular murder, terror and violence is as equally true as democracy, negotiation and dialogue. Subjectivism shuts down people´s critical faculties, making them suggestible for any ideology. It involves making people quit thinking critically in order to open them up to thinking magical about that thought distortions such as Subjective validation, Confabulation and Communal reinforcement lead to bliss (see my book A dictionary of thought distortions). In New Age hypnosis is directly used as a means for inducing in people certain worldviews (see my article Hypnosis, hypnotherapy and the art of self-deception). The subjectivism in the WingMakers Project can be seen in the question about whether the WingMakers material is fact or fiction. The introduction to the project says as follows: “It is fact wrapped in fiction otherwise known as myth.” So here we see how subjectivism is used as an attempt to get the line between fact and fiction blurry and obscured. It is also an attempt to avoid critique. Without success, because the story, as mentioned, ends in pseudohistory. Yet he discusses the Urantia Book, extraterrestrials, 2012, the Shining Ones, DNA activation, Jesus, who he says is a member of the Lyricus Teaching Order, metaphysics, Remote Viewing, chakras, the Christ, the Galactic Federation, the Eternal Watcher, Zeti Reticuli, teachers of light, ascended masters and so on and so forth; all of which are standard New Age subject matter. He promotes ideas such as that all existence derives from one source of divine energy, and that everything is universally connected. He talks about energy fields and personal transformation by means of guided imagery and meditation that will ultimately help bring about global transformation. He promotes positive psychology (= The New Thought Movement and the law of attraction, which the WingMakers website also has a link to, explained as a metaphysics link), and quantum mysticism including the subjectivistic notion that thought creates reality. He discusses multidimensional reality and multidimensional beings. He claims to be a reincarnation of famous historical figures. All the WingMakers associated music would only ever be classed as New Age Music. The only thing that distinguishes James´ writing from New Ageism is, as mentioned, the invented terminology. On the associated website eventtemples.com you can find some guided meditations. And when meditation and other spiritual exercises (it doesn´t matter that such meditations are about positive things such as healing etc.) are used in combination with the subjectivistic techniques of shutting down people´s critical faculties (the only means we have in order to clarify thought distortions – again: see my book A dictionary of thought distortions), the energy, which meditation gathers, will be projected into our thought distortions, and meditation will become communal reinforcement of the fascistic ideas of WingMakers. The use of relativism and subjectivism in management theory (“it is not facts, but the best story, that wins!”), can be seen in a new trend within New Age: storytelling (see my article Management theory and the self-help industry). This can be seen in New Age movies such as The Secret, What the Bleep Do We Know?, and The Living Matrix. What the Bleep do We Know combines documentary-style interviews, computer-animated graphics, and a narrative that describes the spiritual connection between quantum physics and consciousness. The plot follows the story of a deaf photographer; as she encounters emotional and existential obstacles in her life, she comes to consider the idea that individual and group consciousness can influence the material world. Her experiences are offered by the filmmakers to illustrate the movie´s thesis about quantum physics and consciousness (read more about this movie in my article Constructivism: the postmodern intellectualism behind New Age and the self industry). The producers of the above mentioned films probably believe in their ideas, but there is an even newer trend within New Age, where you fully conscious are creating a hoax. This is, as already mentioned, seen in the WingMakers´ Project. It is a sophistication to assert, that Einstein´s theories of relativity should imply, that there is no objective or true description of the physical reality. This is a confusion of physical relativity with epistemological relativism, which corresponds to a similar misunderstanding of quantum mechanics as subjectivistic. Quantum mechanics is not subjectivistic in the sense, that it is the human consciousness, which produces the phenomena. It is not the consciousness of the physicist (the subjective), which makes the electron behave as a wave. It is the macrophysical (material) experimental devices, which affects the electron in such a way, so that you unambiguous know, that if you work with this type of apparatus, then the electron will always behave as a wave. But it is actually possible to use quantum mechanics to support both philosophical and spiritual point of views. The creator of quantum mechanics, Niels Bohr, is in his philosophy very inspired by Taoism. His coat of arms is showing the yin and yang symbol. The paradox is, that his philosophy/spirituality, which of course is grounded in quantum mechanics, directly pulls the carpet away under quantum mysticism. Quantum mechanics shows namely, that it is the order of nature that decides how we shall use our thoughts and language, it is not us that can create in reality as it fit us. The phrases old-thinking and new-thinking are also very popular within the so-called postmodern intellectualism, which is the background for what I consider as a wrong spiritual turn within the more popular, common movement of New Age. In this movement I for example have heard people refer to themselves as New Thought Ministers (again: see my articles Six common traits of New Age that distort spirituality and The New Thought movement and the law of attraction). This new language accepts the use of thought distortions (see my book A dictionary of thought distortions) – as for example rhetoric, ad hominem move, sophistry, and is extreme hostile towards critical thinking. Therefore they demand that science has to be integrated with alternative sciences (and alternative views of human rights), what I call the Illuminati-aspect of The Matrix Conspiracy, because science can´t be mixed with spiritual or political concepts. If this happens, then it is not science anymore. The same thing with relativistic and subjectivistic views of human rights; then it is not human rights anymore. Postmodern intellectualists are through this use of language often trying to get a political agenda forced through. If you change the political terms with spiritual terms, though, the same language is used in New Age circles. As an example is the famous American New Age guru Deepak Chopra, who has invented the concept of quantum healing, which again is based on the misunderstanding of quantum mechanics, that the mind can control everything. Chopra is without hesitation going into discussions with experts, and is precisely using the above-mentioned language (read more about Chopra in my article Quantum mysticism and its web of lies). This means, that both materialism and idealism (subjectivism and relativism) are invalid point of views. On the one side quantum mechanics breaks with the principle of causation and determinism, so that neither the human brain/thought, or nature and evolution, can said to be fully cause-determined systems, as materialism claims. On the other side you can´t say neither, that the principle of causation and determinism are invalid, as idealism (subjectivism and relativism) claims. They are still valid, but with a limited scope of application. Instead you must use the complementarity-principle. The fact that causality is preserved in quantum mechanics makes time travel theories based on quantum mechanics invalid. And since everything in this way only work correlative, yes, then Nagarjuna claimed, that we actually can´t say anything about the wholeness, only dualistic about the parts. Therefore he called the wholeness the Emptiness (´sûnyatâ) – a teaching, which had one quite determinate purpose: the neutralization of all the dogmas, theories and viewpoints, which ignorance has created. The WingMakers Project doesn´t seem to have this argumentation included in his system, since it in opposition with this directly creates a lot of dogmas, theories and viewpoints. The concept of emptiness refers to the intuitive experience of reality, that all inner and outer phenomenons are devoid of independent existence and form of being. What they can be said to be, they can only be said to be in relation to something else, a complementary thing and vice versa. In that way they are nothing by virtue of themselves, and therefore nothing by virtue of something else either, etc. They are insubstantial, or as Nagarjuna calls it: codependent originated (everything that exists does so dependently on other things) (pratityasamutpanna). In absolute sense nothing exists independently, eternally or unchangeable. All existence is impermanent; everything that exists is transitory, lasting only a moment. Nagarjuna´s teaching is in that way a kind of Dream Yoga (see my article What is Dream Yoga?). The problem with time travel is then of course, that it is only in the energy aspect of humans you can talk about time travel. The same problem is happening when you on the astral plane try to go back or forth in time, you would then loose more and more consciousness. I will return to this problem below. In the WingMakers Project everything is reduced to the energy aspect, though. This reductionism is due to the attempt of synthesizing spirituality, science, yes, all kinds of theories. The WingMakers Project is here inspired by Darwinism, and its theories about human evolution. The idea comes originally from Theosophy, later from Ken Wilber´s system, where spirituality, apart from Darwinism, furthermore is sought synthesized with new developments within psychology, psychotherapy and natural science, especially biology and quantum mechanics. The WingMakers´ problem is the integral method itself; that is: the attempt of synthesizing science, spirituality, consciousness, evolution, etc., etc. According to The WingMakers Project all evolution is basically the evolution of consciousness. So, consciousness is reduced to evolution, or, the energy aspect of Man. And such a philosophy of consciousness ends in serious metaphysical problems, such as the free will problem, and the problem of personal identity, which are quite central, when you talk about spirituality (again: see my article The pseudoscience of reductionism and the problem of mind). In the following I will argue for that time travel not is possible. It is no coincidence when I say, that the thought about time travel is as old as the human thought, and that this has been shown in fiction, or, if in science, only as a theory. My main arguments against the possibility of time travel is namely that all the different theories of time travel confuse thought with reality; that their arguments are based on magical thinking, even if they are materialists. The theory of time travel is often supported by materialists (physicists), but they are ending up in subjectivism. If you should time travel in reality, this would mean, that you should bring reality with you, either back in time, or forwards in time. And with reality we are talking about the wholeness, everything. And with reality and wholeness I also mean the now and therefore consciousness. You would also had to bring the now, and the consciousness, either back in time, or forwards in time. And what becomes of the reality and the now you have left? And all the people and their consciousnesses? And the whole of the universe? All this would now either be the future or the past. That would mean that time travel had to change everything in the wholeness, which then again mean, you had to change everything in an infinitely number of times. In that way a time travel theory would have to explain how everything had to be changed infinitely. A time travel theory had to involve a theory of everything, and a theory of everything is not possible as Niels Bohr claims (see my article Quantum mechanics and the philosophy of Niels Bohr). If you traveled back and forth in time, then the consciousness of course should follow you, and therefore reality, and therefore the now, and therefore the wholeness, and therefore infinity. That would mean that the now you had left would have to change into, either the future or the past. Everything you had left therefore had be destroyed an endless number of times and when you arrive in either the past or the future everything should be created an endless number of times. It ends in the thought distortion I have called Endless split of the thought (see my book A dictionary of thought distortions). You can´t talk about consciousness in the energy aspect of Man. You can´t talk about consciousness (and therefore the now/reality/wholeness) in the same area as time travel. You end in an endless split of the thought. Before we go further it is important to mention, that evolutionism – also in its most modern Neodarwinistic version – is a natural historical report, and not a natural scientifical theory. Neodarwinism can – as all other historical sciences – only retrospective explain the development up to now in a rational way. This appears clearly from the fact, that it can´t give any scientific well-founded prediction of the future development. It is not possible with any reasonable precision to predict the future biological development on the background of the theoretical foundation of evolutionism. Until today Man has not been able to do anything in order to change his genes. This has been changed with the modern genetic engineering, which already in principle has made it possible to change the genes of our gametes. In the future the problem about conscious changing peoples´ genes in order to improve certain characteristics is not any technical difficulty. It is in turn a serious ethical and political problem about setting limits and about, where these limits have to be set. The reductionism of The WingMakers Project is due to the attempt of synthesizing spirituality and science. As in Theosophy, and in Ken Wilber, and in The Human Design System (about The human Design System: see my article A critique of The Human Design System) - the WingMakers Project also is inspired by Darwinism, and its theories about human evolution. And this is furthermore sought synthesized with new developments within psychology, psychotherapy, natural science, especially biology and quantum mechanics. The whole thing is presented as an ideology with a lot of attempts to predict the future evolution of Man, often connected with eugenics: the applied “science” or the bio-social movement (social Darwinism) which advocates the use of practises aimed at improving the genetic composition of people, usually referring to human populations. Although Fascism is considered to have first emerged in France in the 1880s, its influences have been considered to go back as far as Julius Caesar. Thomas Hobbes, Niccoló Machiavelli, and Hegel have also been considered as influential, as well as contemporary ideas such as the syndicalism of Georges Soral, the futurism of Filippo Tommaso Marinetti, the nationalist and authoritarian philosophy of Oswald Spengler and the conservatism and Social Darwinism of Enrico Corradini. The synthesizing of authority, hierarchy, race, eugenics, purity, unity, spirit, within these influences, is shared by the WingMakers Project, where reductionisms such as biologism, psychologism, sociologism and historism go hand in hand. Fascism is often mischaracterized as “extreme right”, although writers have found placing Fascism on a conventional left-right political spectrum difficult. There is a scholarly consensus that Fascism was influenced by both left and right. Some fascists have themselves promoted their ideology as a “third way” between Capitalism and Communism. And here we precisely have the heredity and environment ideology, which includes reductionisms, that support respectively right-wing and left-wing political point of views (again: see my article The pseudoscience of reductionism and the problem of mind). And combined with New Age, we can begin to see the rising of a new kind of Fascism; what I under one title call The Matrix Conspiracy (see my article The Matrix Conspiracy). The WingMakers Project is only a symptom of this. I don´t think it in itself will have much success. The people behind the WingMakers website have a couple of times changed the concept of the WingMakers. It seems like they are doing this in order to avoid critique, or to keep on producing new sales articles. In 2014 they have changed the concept, and the website, once more. The original concept is now one book (The Ancient Arrow Project), among others - or you might say: one interpretation of truth, among others. On the top on this page I have uploaded a free PDF Version of the WingMakers own original introduction, when this book was the whole content of the website. I have also uploaded a free PDF Version of the book The Ancient Arrow Project. I have done this because it is this information my article is based on. But the critique in the article is still valid, since the message of The WingMakers is the same: there is a spiritual hierarchy (the WingMakers as the superior spiritual essence of humanitity) which James Mahu, a real existing channeler, are channeling, and who therefore is the creator of the whole content of the website. Therefore you also hear the continuing claim that the content of the website is a mix of fact and fiction. And therefore all the problems of pseudohistory, pseudoscience, quantum mysticism, reductionism, evolution, genetics, spirit, hierarchy, and consequently fascism - which I have described in my article - persist to characterize the website. On my blog I have written a short critical introduction called The WingMakers Project. My Pop Culture File on Star Wars is also a follow-up to this article. Note! The people behind the WingMakers website have a couple of times changed the concept of the WingMakers. It seems like they are doing this in order to avoid critique, or to keep on producing new sales articles. In 2014 they have changed the concept, and the website, once more. The original concept is now one book (The Ancient Arrow Project), among others - or you might say: one interpretation of truth, among others. I have uploaded a free PDF Version of the WingMakers own original introduction, when this book was the whole content of the website. I have also uploaded a free PDF Version of the book The Ancient Arrow Project as well as the interviews with Dr. Jamisson Neruda, which are an extension of The Ancient Arrow Project novel. Moreover I have uploaded the philosophy of the WingMakers. The fifth Interview with Neruda (new). This new version is again an example of how the creators of the WingMakers Project are trying to avoid critique. The interview is about breaking out of the illusion we all are living in (The Hologram of Deception), while the whole of the WingMakers Project at the same time is creating a big illusion (The WingMakers mythology), which the creators say is "fact wrapped in fiction otherwise know as myth." This myth should then be reality. Besides that you don´t help people getting out of an illusion by telling a myth which gets the line between fact and fiction blurry and obscured, then another, more sinister aspect of how we can free ourselves from the Hologram of Deception, is the exercises you have to do, which is called The quantum Pause.